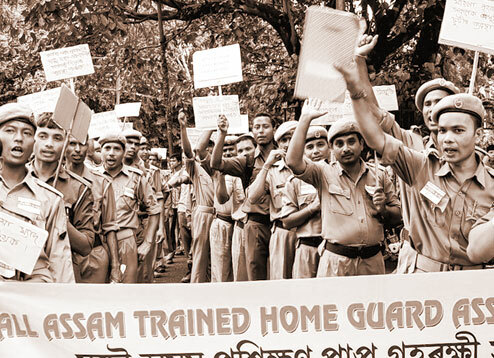 The All Assam Trained Home Guards Association on Wednesday staged a three-hour dharna demanding resolution of various grievances, including regularization of jobs, release of arrears of salaries, enhancement of salaries, engaging trained home guards in the regular police force and amending the 1947 Home Guard Act. In Kokrajhar, over 400 home guards from various parts of the district and Chirang district took part in the demonstration on Wednesday in front of Kokrajhar Deputy Commissioner’s office and carried out a protest dharna. The protestors have been demanding regularization of jobs, induction of trained home guards into government offices, hike of salaries according to the government pay scale, maternity leave to the women home guards and amendment of the 1947 Assam Home Guard Act. The association has warned to take up rail, national highway blockade if their demands are not met.